From his abundance we have all received one gracious blessing after another. Today we travelled to the ancient ruins of Sephorus/Zippori (most likely where Joseph and his apprentice son, Jesus, would have plied their trade); hiked the Tel Megiddo (21 layers of civilization and the place named in the Bible for the final spiritual battle to end everything…Armageddon in English is “Har Megiddo” – hill of Megiddo – in Hebrew); toured the farm of Nazareth Village (a live museum, if you would – a working farm using first century tools and methods); wandered through the Church of the Annunciation (built on the ruins of the house where Mary would have been living when she was visited by the Angel, Gabriel); and stopped in Cana (the site of Jesus’ first public miracle) to purchase wedding wine. The wonderful thing about today for me was the unexpected. Both the trip to the Church of the Annunciation and the stop in Cana were not on our itinerary. But because our guide is amazing, he made the suggestion of the trip to the Church of the Annunciation and was happy to oblige my Dad’s request to stop in Cana. Both places turned out to be wonderful additions to our day. In the lower level of the Church of the Annunciation is the grotto with the ruins of Mary’s house. 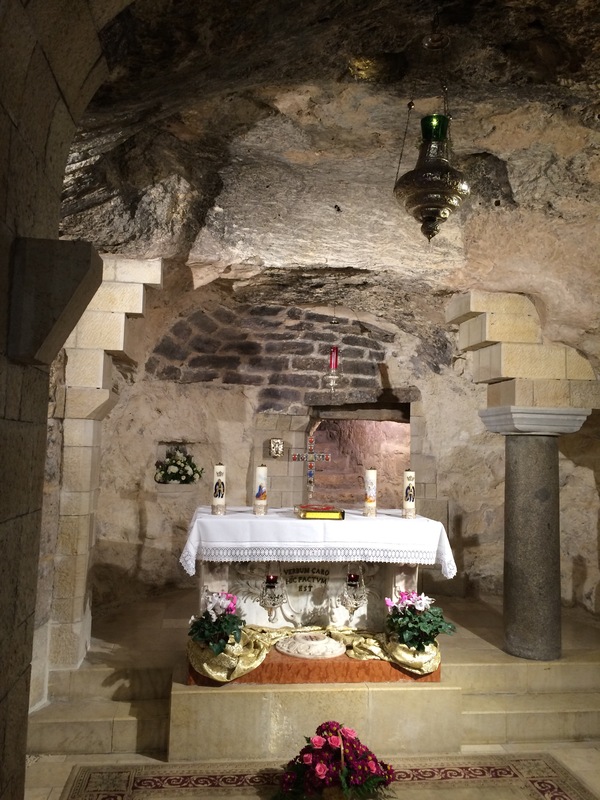 While we gazed at the ancient ruins of her home in Nazareth, there was a Catholic service taking place upstairs in the sanctuary of the church. We were surrounded by worship music (albeit in a different language!) as we marveled at the ruins. We couldn’t have planned that if we tried. It was an unexpected blessing – a gift from our abundantly generous God. When we stopped in Cana we got to taste the wedding wine before purchasing it, if we wished. And in the way of Christians everywhere, we found ourselves sharing a moment of community and fellowship in the midst of what was otherwise a tacky souvenir shop. It’s astounding how God’s people gathered together can transform a place. In some ways it was a silly little stop. But seen through what one of my friends calls a “baptized imagination,” it was another unexpected blessing. 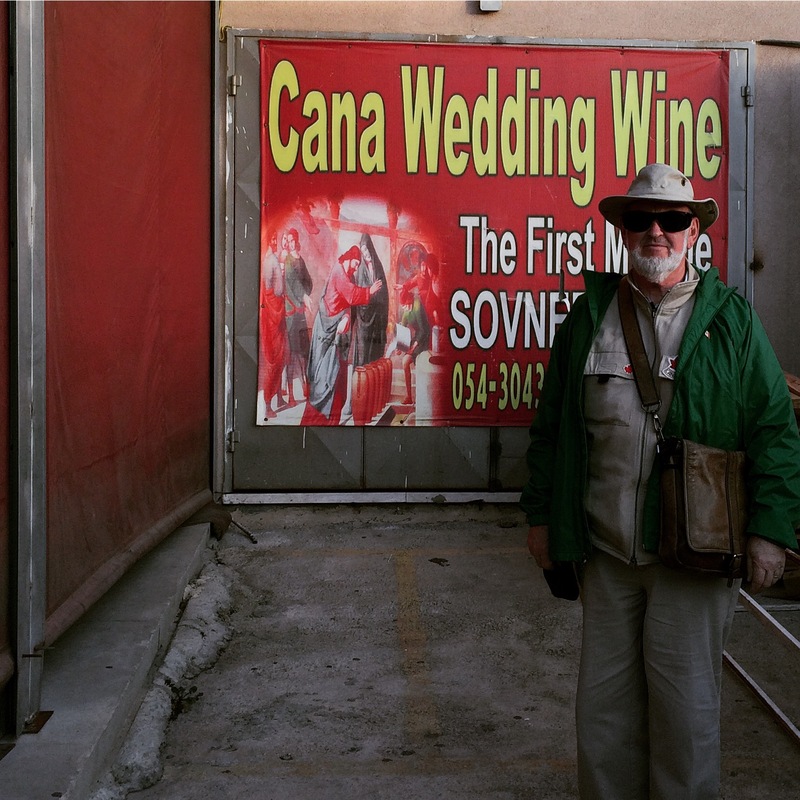 My Dad at the shop where we picked up wedding wine in Cana. The altar places in the ruins of Mary’s house in Nazareth. 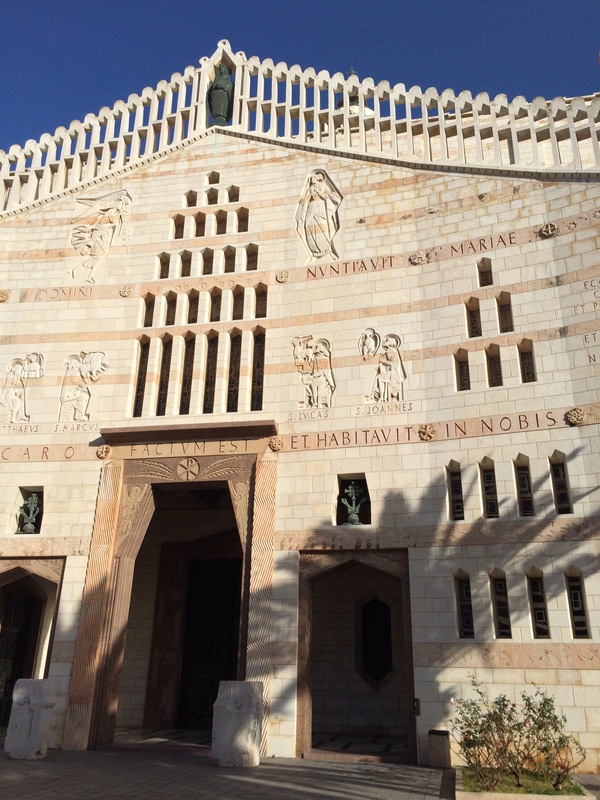 The front of the Church of the Annunciation.